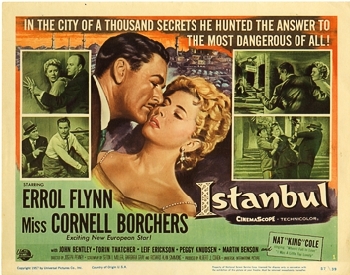 I Was A Little Too Lonely (And You Were A Little Too Late) was featured in Istanbul, a 1957 American adventure–drama film directed by Joseph Pevney and starring Errol Flynn, Cornell Borchers and John Bentley. It is a remake of the film Singapore with the location of the action moved to Turkey. The plot involves an American pilot who becomes mixed up with various criminal activities in Istanbul. Adventurer James Brennan (Flynn) returns to Istanbul five years after being ejected under suspicion of diamond smuggling. In flashback, he recalls his last days there, his torrid love affair with Stephanie Bauer (Borchers), the efforts of shady characters to obtain a strange ornament he received from a friend, and Stephanie’s disappearance during a fire. Now that Brennan is back, Stephanie (or her double) reappears, and there’s still the question of where the supposedly smuggled diamonds are.